In the first outbreak of bird flu in India, eight persons were today admitted to a hospital with suspected deadly avian virus after 50,000 birds died in Nandurbar and Dhule district of Maharashtra. Should public schools have some subsidised seats reserved for poor students? The much awaited Thar Express carrying 257 passengers from Karachi in Pakistan arrived at the Munabao station here on Saturday afternoon to a grand reception. 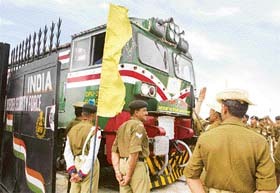 Border Security Force personnel watch as Pakistani train enters Zero Point between India and Pakistan at Munabao in Rajasthan, on Saturday. The Punjab Council of Ministers today approved the draft of Governor’s address for the Budget session starting here on Monday besides clearing proposed amendments to the Value Added Tax Act. It also gave the go ahead for setting up of a National Institute of Law. Sadhu Ramnarayan Das (65), an active member of the Ayodhya movement, who had complained of a threat to his life from a section of the BJP leadership was found battered to death yesterday. The UPA government does not want to link up nuclear proliferation with religion and politics of vote banks and is confident of bringing the livid Left parties on board on the issue of Iran. This was stated by new Minister of State for External Affairs Anand Sharma in a conversation with The Tribune. We will not allow, we cannot allow, another nuclear weapon state in our neighbourhood. Politics in Karnataka took a new twist today when JD (S) supremo H. D. Deve Gowda suspended Chief Minister H.D. Kumaraswamy and 39 other rebel MLAs from the party with immediate effect. Even as the BJP-led NDA attacked the Manmohan Singh government on the headcount of Muslims in the armed forces, its government in Jharkhand has initiated a similar exercise in the police force of the state. 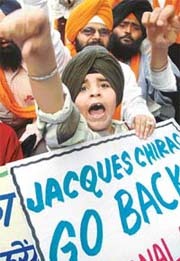 Hundreds of Sikh schoolchildren will march here during next week’s visit of President Jacques Chirac in protest against a ban on wearing turbans in French state schools, according to the Shiromani Akali Dal Panthak (Jathedar Santokh Singh).